Anatomy of the spine, vertebrae and discs. The spine is composed of a column of vertebrae interposed with fibrocartilaginous discs. 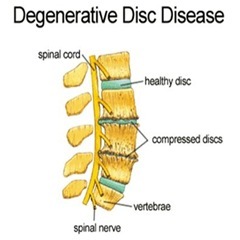 The discs serve to allow movement between the vertebrae and cushion the vertebral column from compressive and rotational forces. Each disc has an inner semi-fluid material called the nucleus pulposus encased in a tougher cartilaginous ring called the annulus fibrosus. Over time, the discs are prone to degenerative change. Repetitive pressure of the nucleus pulposus against the annulus fibrosus (as occurs with bending and lifting) can cause small tears in the annulus which may lead to “bulging” of the annulus. Fluid from the nucleus can leak through these small tears into the spinal canal and irritate adjacent spinal nerves. What is a ruptured or slipped disc? In the worst case, the annulus can rupture, thus permitting the inner nuclear material to escape into the spinal canal. 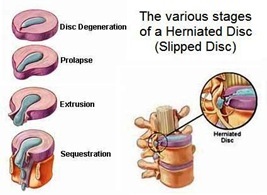 This is called a herniated (slipped or ruptured) disc. 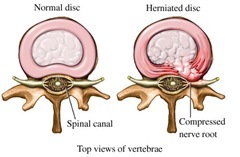 A herniated disc can usually be readily visualized on computed tomography (CT) or magnetic resonance imaging (MRI). Although a bulging disc may be visualized as well. Its mere presence, however, is not necessarily the cause of pain. Bulging discs can be symptomatic or asymptomatic. Many patients have neck or low back pain (so-called “axial” pain) which does not produce symptoms or signs of nerve root irritation. Localization of the pain to a specific cervical or lumbar disc is therefore difficult. Discography may be used to help determine if disc disease is responsible, and, if so, which disc is involved. Discography involves the injection of a radio-opaque substance (visible on x-ray) into one or more discs in an attempt to reproduce the type of pain that the patient is experiencing and thus possibly identify which disc is the source of the pain. Images of the injected disc are taken using computed tomography (CT) to visualize any tears in the annulus. If you are having back pain from a ruptures or slipped disc, contact us today to schedule an appointment with best back pain doctor in NYC, Dr. Matthew Grimm. ← Dr. Grimm answers the question: What is an EMG test?